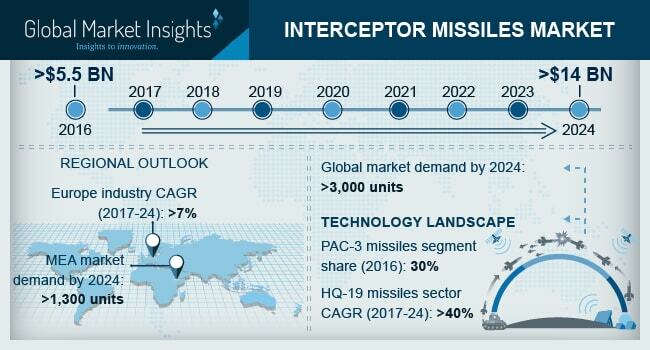 Interceptor Missiles Market size is estimated to surpass USD 14 billion by 2024; according to a new research report by Global Market Insights, Inc. Global interceptor missiles market is expected to cross 3,000 units till 2024. Continuously increasing threat of attacks from rival countries has resulted in proliferating demand for interceptor missiles over the forecast timeframe. Multiple countries across the globe including Netherlands, U.S, Israel, Saudi Arabia, UAE, Qatar, etc., have purchased patriot interceptor missiles to strengthen their defense inventory, impacting the industry positively. Countries across the globe have witnessed a considerable increase in their defense budget. For instance, in 2015, the defense budget of China was USD 131 billion, which was increased by 11% and crossed USD 145 billion in 2016 and was further increased by 7% in 2017. This will accelerate the revenue generation owing to their enhanced purchasing power for defense systems. However, high initial investment and high manufacturing costs may restrain new entrants from entering the interceptor missile market. Industry is witnessing regular upgradations and innovations in interceptor missiles. For instance, HQ-19 is a significant upgradation of HQ-9 and has gained prominence in 2017. It is capable of targeting satellites and ballistic missiles in lower earth orbit and is featured with kinetic kill vehicle. Moreover, it can intercept the ballistic missiles from a range of 3,000 kms. These innovations are anticipated to induce immense growth potential to the interceptor missiles market size over the coming years. Surface to air missiles are expected to capture maximum interceptor missiles market revenue share of more than 80% by 2024. Some of the benefits offered includes light-weight and portability which in turn will drive the industry demand. Water to air missiles will exhibit approximately 7% CAGR owing to rising adoption of these missiles in various countries across the globe for naval border protection. Interceptor missiles of up to 125 kms range are anticipated to dominate the interceptor missiles market, generating a demand of over 2,000 units till 2024. Continuously increasing penetration of missiles conforming to this range such as PAC-3, Iron Dome, and SM-3, from MEA including UAE, Israel, and Saudi Arabia will primarily support the industry dominance. Interceptor missiles of range above 200 kms will exhibit over 18% CAGR in terms of revenue owing to rising deployment of advanced missiles such as HQ-19. Regular innovations in these missiles in countries such as China will further strengthen the industry penetration over the forecast timeframe. PAC-3 is expected to account for highest interceptor missile market share crossing USD 6 billion over the coming years. Proliferating demand of these missiles, especially in developed countries will primarily support the revenue generation. For instance, in January 2013, the U.S. army entered into several contracts worth USD 755 million for purchasing 168 PAC-3 missiles and associated services and equipment. HQ-19 will exhibit over 40% CAGR till 2024 owing to its continuously rising usage as an upgradation of HQ-9. Its enhanced features as compared to its counterparts will further support the industry growth till 2024. MEA interceptor missiles market will showcase dominance over the next eight years owing to rising threat of enemy attacks across the region. Collaborations of various countries with industry players for purchasing of these missiles will further contribute towards the high revenue generation. For instance, UAE and Qatar are anticipated to enter an agreement with Lockheed Martin for supplying patriot missiles. Europe will witness over 7% CAGR till 2024 owing to rising sales of interceptor missiles from countries including Sweden and Poland. Lockheed Martin Corp., Boeing Co., Raytheon Co., Aerojet Rocketdyne, and Rafael Advanced Defense Systems are among the major industry players. Regular product innovations is among prominent strategies implemented by these participants. For instance, in January 2018, Lockheed Martin made enhancements in Aegis missile that is anticipated to result in rapid detection of threats and reduction in reaction time.